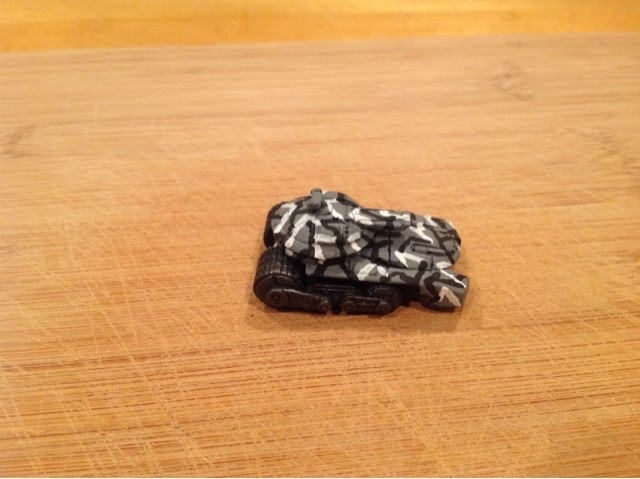 This is a 10mm tank for my not storm trooper forces. 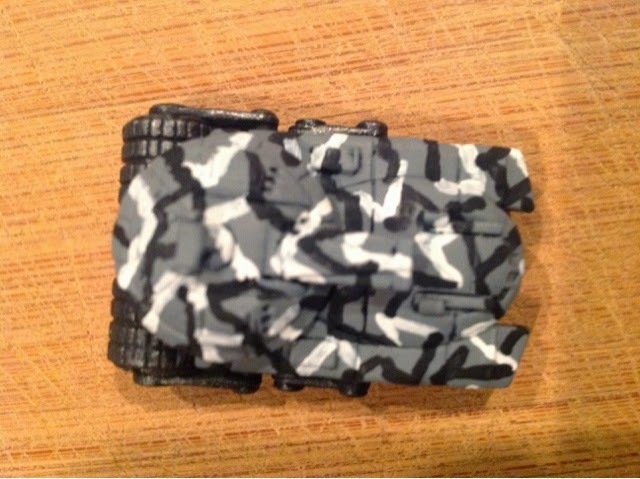 Through use of simple urban camo scheme, I have made my model unrecognizeable....not sure but I think I like basic colors better. 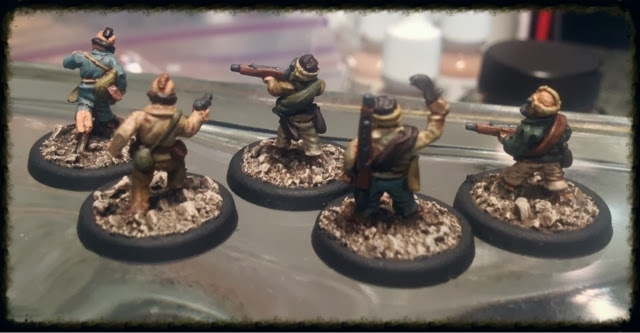 Hello, just wanted to discuss a little about what I have been working on. Have been designing an add on for Gruntz .it is more of a campaign system for small scale gaming in the Gruntz setting of Heliopause. The working title is Outpost Security Force...or OSF for short. In it you will assume command of a small squad/ platoon of mercs responsible for providing security for a corporate outpost on a wild mining planet. 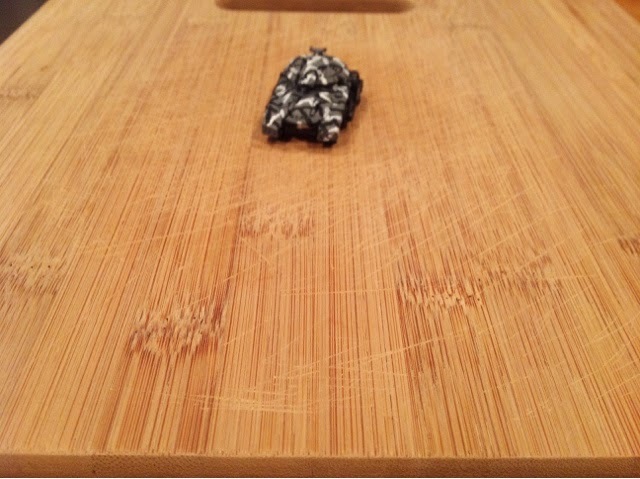 95% of the rules will be Gruntz, so ownership of Gruntz rules is necessary. It is primarily a solo campaign system, of man to man skirmish using the rich heliopause setting as a backdrop. There is character progression....and best of all...if it ever gets playable it will be a free download. 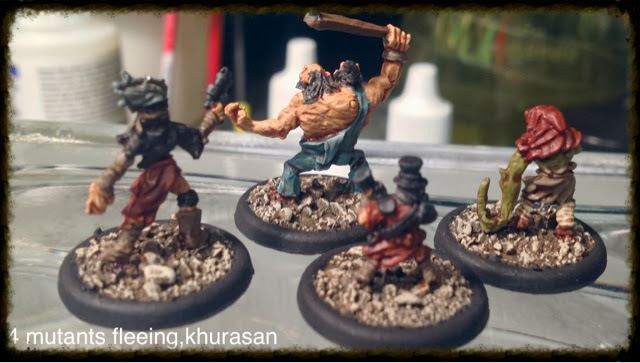 Hi , here are 4 wasteland survivors ....3 are from khurasan, 1 from GZG , I think. 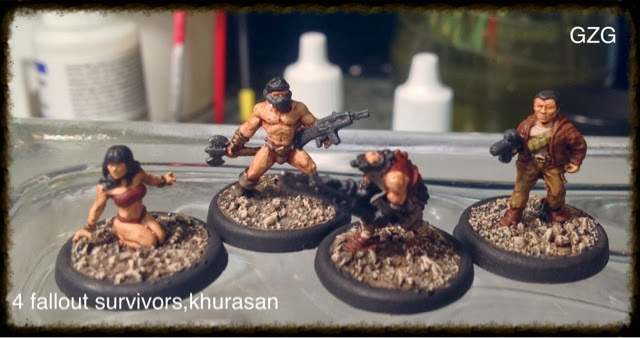 The beefcake guy has a head swap from GZG and a khurasan pulse rifle added...he used to be the not Conan model....always liked playing fallout with a ridiculous close combat beast like that, rushing in beating everything to a pulp. 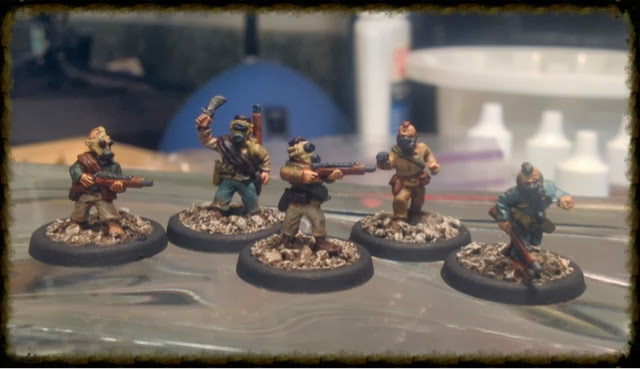 Gasmask head packs combined with khurasan Paraguayan squad from his Chaco wars range in historical minis. 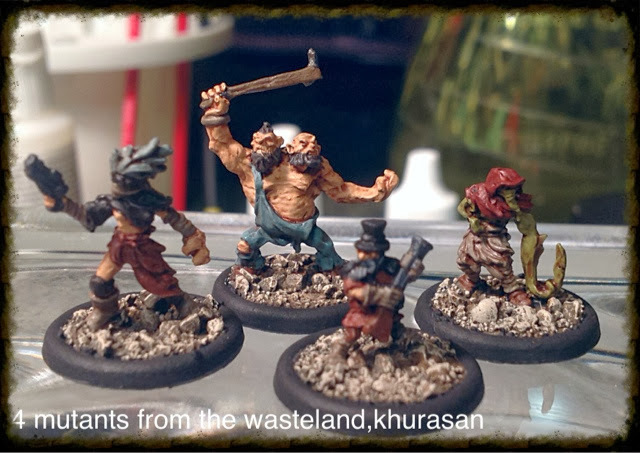 I really like the way these guys turned out, inspiration for this came from lead adventure minis range of post apocalyptic minis by ratnik. 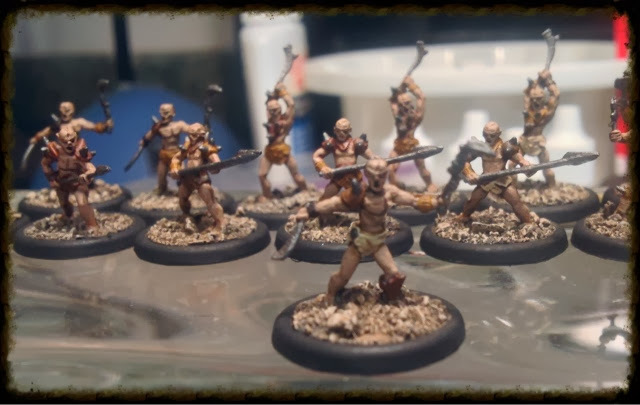 Just finished a warband for wastelands 3.0, 18 man unit of cannibal savages. These are from khurasan,basically painting whatever I find first when retrieving things from storage. 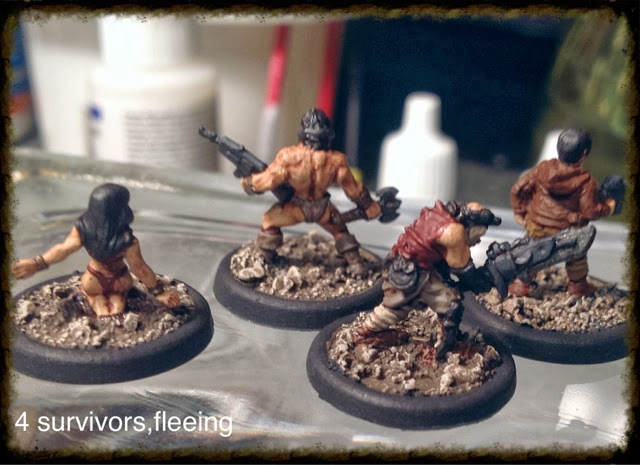 Really fun figs to paint up...I think they look better with vaguely flesh colored skin instead of greenish. Why is the default for mutants always a greenish tint? Reminds me, I have some 2nd ed. 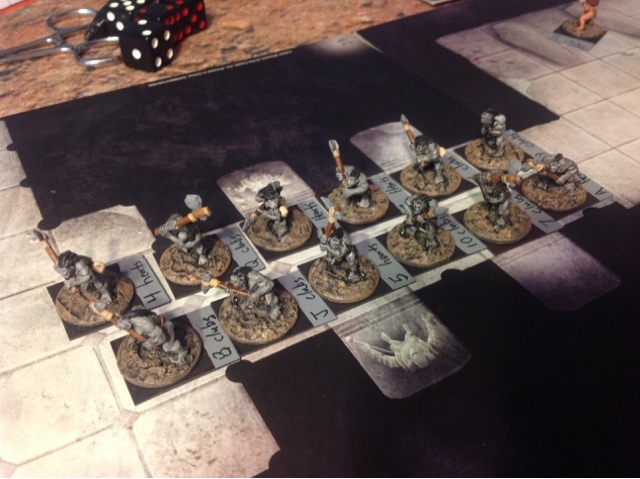 Orcs I painted grey instead of green. 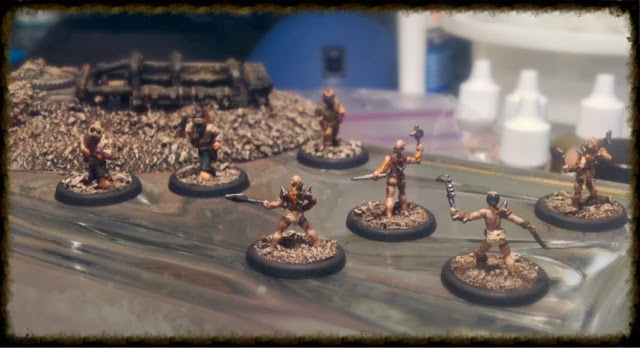 At least now I have an opponent for some wastelands gaming, now I have two factions, robots,and cannibal savages. 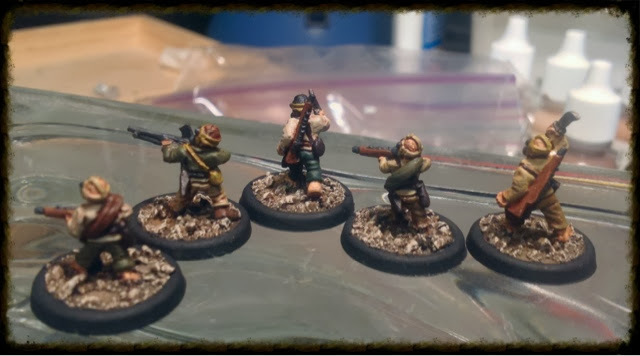 Next up is a squad of human stalker/explorers.